Dubai, UAE, May 16, 2018: The latest pin‐ups to grace the Graham Chronofighter Vintage Nose Art Ltd timepieces have spread their wings. They've moved on from the aviation origins of nose art to feel the rhythm of the inspiring sounds that captivated 1940s and 1950s dance floors. 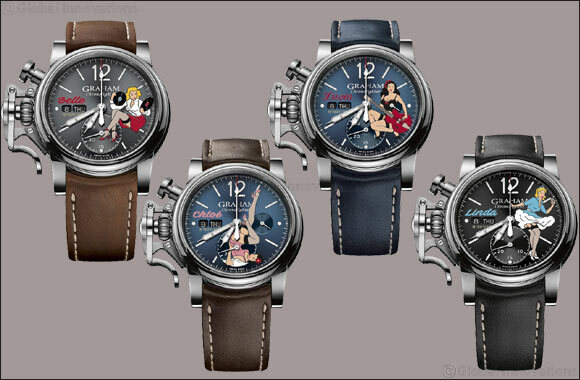 Four hand‐painted glamour girls grace the dials of four numbered limited editions, each one comprising 100 pieces. Without a second of hesitation they'll whisk wearers' imaginations off to times when Elvis was king and red lipstick ruled. Belle speaks to today's vinyl revival as she selects the discs that turned attention to freedom and emancipation after World War II. Linda has already hit the dance floor without any inhibitions about raised hemlines and eyebrows. Red guitar at hand, Lucia will strike a chord with nostalgic souls happy to have a flamenco soundtrack for their reminiscing. Chloe masterfully combines Moulin Rouge with pretty in pink.